Basil Sellers AM has today, announced that Richard Lewer has been awarded the 5th and final prestigious $100,000 Basil Sellers Art Prize for his work titled The Theatre of Sports (2016) at the Ian Potter Museum of Art at the University of Melbourne. The Theatre of Sports is a compendium of twelve paintings that form one work. It represents Lewer’s sustained passion for art and sport, and examines the role sport can play in relation to mental illness. His practice looks at extremes of behaviour, centering in this work on the very public moments of failure of well-known sporting figures. Director of the Ian Potter Museum of Art at the University of Melbourne, Ms Kelly Gellatly commended all of the shortlisted finalists for the depth of their engagement with the theme of sport and the quality of the work that they created, across media, around the theme. Born in Hamilton, New Zealand in 1970, Melbourne based artist Richard Lewer’s narrative based practice centres around his fascination with history and culture and often engages, as a result, with customs, beliefs and rituals. After completing a Bachelor of Fine Art from the Elam School of Fine Art at Auckland University in 1992, Lewer went on to complete a Master of Visual Arts at the Victorian College of the Arts, University of Melbourne in 2000. Lewer has exhibited in numerous solo and group exhibitions including: The Best Thing About Being Away is Coming Home, Sullivan+Strumpf, Sydney (2016); Believe It or Not, Hugo Michell Gallery, Adelaide (2015); Footy Fever, Canberra Contemporary Art Space, Canberra (2015); Epic Narratives, PICA Salon, Perth Institute of Contemporary Art, Perth (2015), and Death at the Casula Powerhouse Arts Centre, Sydney (2015). Lewer has been the recipient of many prizes including: The City of Albany Art Prize (2015), The Blake Prize (2014), and the Black Swan Portraiture Award, Perth (2013). His work is held in many institutional and private collections, and has been a finalist of the Basil Sellers Art Prize in 2008, 2010 and 2014. The other 2016 finalists are: Abdul Abdullah, Dana Harris, David Ray, Eamon O’Toole, Fiona McMonagle, Grant Hobson, Jane Brown, Kate Daw and Stewart Russell, Laith McGregor, Rew Hanks, Shaun Gladwell, Trent Parke and Narelle Autio, Vipoo Srivilasa and William Mackinnon. Over 240 artists from all over Australia submitted entries for the $100,000 Basil Sellers Art Prize, one of Australia’s richest and most prestigious art awards. An additional $5000 People’s Choice award will be voted for by visitors to the exhibition. This year’s judging panel included Basil Sellers AM; Kelly Gellatly, Director of the Ian Potter Museum of Art; Dr Chris McAuliffe, consultant for the Basil Sellers Group; Maurice O’Riordan, director of the Northern Centre for Contemporary Art, Darwin; Christine Clark, Manager of Exhibitions at the National Portrait Gallery, Canberra; and Chris Langford, former member of the AFL Commission. 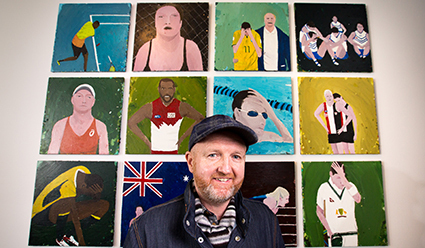 The Basil Sellers Art Prize is a biennial contemporary art prize and exhibition which focuses on the theme of ‘art and sport’ and has been held at the Ian Potter Museum of Art at the University of Melbourne since 2008. The Prize encourages artists to take on the theme of sport in any artistic medium and supports artists whose work explores Australia’s obsession with sport. The prize is supported by Basil Sellers AM, a businessman and philanthropist, and a well-known collector of art and a sports enthusiast who spends his time between Australia and Europe. The Basil Sellers Art Prize is a long-term project, involving 5 biennial awards from 2008 to 2016. This year marks the fifth and final prize, which aimed at changing Australians’ perception and enjoyment of art and sport. The finalists of the 2016 Basil Sellers Art Prize will be exhibited at the Ian Potter Museum of Art, the University of Melbourne until 6 November 2016. For more information, visit: www.art-museum.unimelb.edu.au or www.sellersartprize.com.au for details.